The peace of mind that parents can get when they can be assured of always having an eye on their children is substantial. As a result, the demand for baby monitors are high and a result, there are a number of different products that are on store shelves. As one can imagine, there is a considerable variation that exists between these different products. 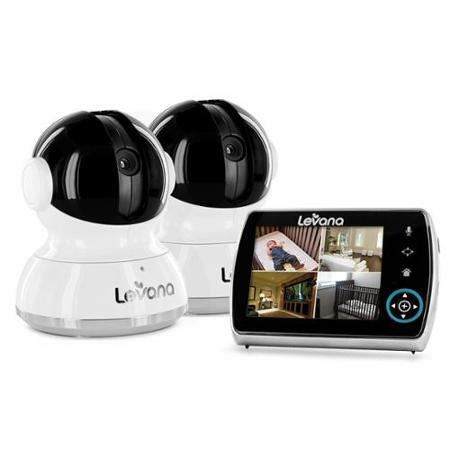 The Levana Keera is one of the best baby monitors that we have the chance to review, owing to the good picture quality, ease of use, and the number of options that are available for parents. The Levana Keera has the ability to record video, meaning that one can keep greater focus the ways in which baby sitters or family members treat the child. In the same fashion, all of the cute behaviors that one’s child does while the parents are out of the room can be captured. The camera have a wide range of motion that does not require one to be in the room to utilize; the monitor gives owners 300 degrees of movement on the horizontal axis and 110 degrees of movement on the vertical axis. We were most surprised about the duration of the Keera battery; in our testing, we were typically able to get around a day’s worth of activity out of the device before having to recharge it. The visual menu of the monitor is intuitive and incredibly easy to use; the touch panel is responsive to one’s touch without getting confused or otherwise bogged down with commands. The Keera comes with 2 gigabytes of storage, which allows for a large amount of pictures to be stored before the Keera needs to be clean out. For those that have chores or other things to do around the house, the Keera also provides owners with the ability to converse with their children. This tool is particularly good in those moments when all a child needs is the soothing sound of one of their parents. The included speaker is able to faithfully recreate voices in a fashion that children can understand and easily identify, rather than distorting and possibly scaring an infant. The Keera also comes with a set of lullabies that may just be what children need to get to sleep, while a multi-color LED provides all of the information that owners will need about the continued operation about their Keera. The company also offers the opportunity to purchase additional camera as the Keera can take on a grand total of four cameras. For more information about the entire variety of baby monitors and similar products that Levana releases, make it a point to visit their website. For promotions and additional news about their product line, Levana’s social media profiles are a good start. Expect to pay about $150 to $170 for your very own Levana Keera digital baby video monitor from a wide array of online and brick and mortar retailers. The device is available directly from the company (with free shipping) for $189.99. Next Next post: Mike Masch, the NEW amplifier in hip-hop!